Play it on a stand... sitting or standing. Play it like a guitar... sideways on your lap. Play it on the endpin... sitting or standing. Hand-Crafted from Choice Black Walnut, with a Select Ebony fingerboard, the Vector Cellette is an elegant solution to all your electric cello needs. The infinitely adjustable stand and lower bouts assure you of an instrument that will accommodate any style and manner of playing. Packed in its fully-padded gig-bag, it can fit in an overhead baggage compartment, yet be set up and ready to play in seconds. 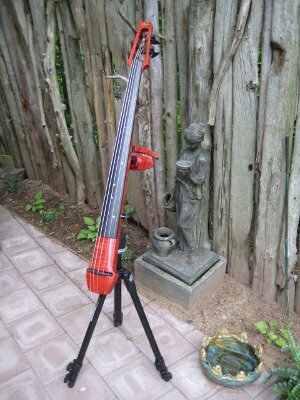 The Barbera Multi-Transducer Bridge is the finest Electric Cello pickup on the market. It provides clarity and definition while retaining the overall warmth and subtlety of a fine acoustic instrument. It offers a wide range of woody tones plus all the subtle nuances of bow pressure and direction. Pizzicato is delivered with great fundamental and bloom on each note. The onboard EMG preamp ensures a convenient interface with amplifiers and PA's. Check out the sound samples! 5 + 6 string Electric Cellos are available with Low F or High E, or both! Fingerboard extensions are also available to Low E.
The Vector Cellette comes complete with a fully padded gig bag and a full one-year warranty. Instruments are always available for a 5-day trial: please enquire.